Ask PG&E to identify power lines in the area and familiarize yourself with their location. When installing aboveground irrigation systems, keep pipes horizontal so you don't lift them into lines by mistake. Adjust spray to avoid shock hazards. 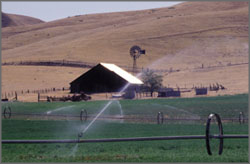 Sprinkler streams from an irrigation system should break into droplets as opposed to flowing in a single unbroken stream. An unbroken stream of water that contacts a power line can conduct electricity and cause a dangerous shock. Keep irrigation pipe at least 10 feet from power lines that carry up to 50,000 volts. Higher voltages require greater clearances.